Our team dust and polish skirting boards, light fixtures, furniture, sills, shelves and blinds. We vacuum/mop all floors, carpets, rugs and stairs and clean glass surfaces. We clean the toilet, all showers, baths, and sinks inside and out. 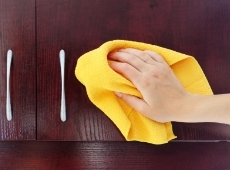 Our domestic cleaner scrub and sanitize all floors and surface, including, seat, lid, tank, and base. In the kitchen a representative of London Cleaning House will clean, dry, and shine all appliance surfaces, range hood, and sink. All kitchen floors will be sanitized and polished where applicable. If necessary they will clean the microwave oven inside and out, including turntable.